Medicines seized from five Bangladeshi nationals who were arrested by Madinah police.The medicines were allegedly stolen from the warehouse of a government hospital in the city. Five Bangladeshi expatriates have been arrested for stealing large quantities of medicines from the warehouse of a government hospital in Madinah. The officers seized medicines worth about SR4 million from the men. This is the fourth incident involving theft of medicines in Madinah in the past two years. Large quantities of medicines have mysteriously disappeared from several health facilities in the province since 2017. In August 2017, Al-Madina Arabic daily had published a report on the disappearance of medicines from the warehouses of King Fahd Hospital. In a second such incident, medicines for the treatment of kidney and hepatitis patients disappeared from the main warehouse of the Ministry of Health. In a third incident of the kind, large quantities of medicines for the treatment of diabetes disappeared from a warehouse belonging to the Diabetes Treatment Center in the holy city. 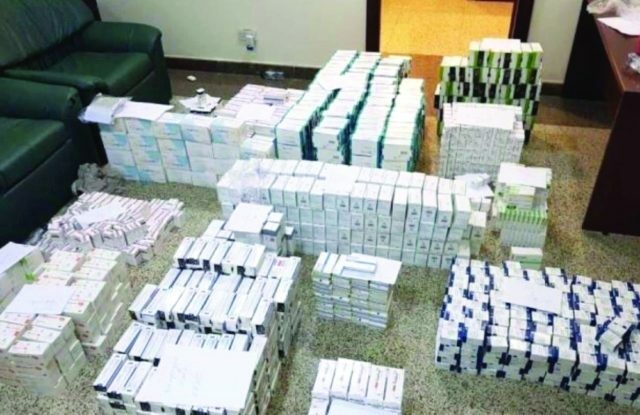 In the latest case of medicines theft uncovered by Public Security officials in Madinah recently, medicines worth about SR4 million for the treatment of hepatitis and kidney diseases disappeared from a hospital, whose name was not disclosed.